Content creation is a fun, but challenging job. It involves frequent brainstorming, detailed research, and knowledge of industry trends. It also helps to be an experienced wordsmith and grammar nerd! We are required to bring original perspectives to the table—not the kind that stop at one or two clever tweets, but perspectives which can be fleshed out into lengthy blog posts, e-books, and white papers. We’re also required to write with enthusiasm. If your writing lacks the spirit, it won’t be able to win over an audience. The supply of inspiration needs to be steady. As a marketer or a content creator, your goal might be to gain expertise in your industry. Therefore, you must read about it on a regular basis. For the sake of your writing, it is essential to expand horizons and pursue a variety of topics. Those topics could be history, anthropology, geology, sociology, psychology, politics, fashion, or whatever strikes your fancy. The only criterion is that you should enjoy it. Something amazing happens when we find material that we enjoy reading. It gives us an insight into not just the topic concerned but also life in general, and our writing comes alive because of it. Human beings are wired to seek patterns. Everything we consume transforms our perspective. Therefore, the more you read, the greater your likelihood of creating analogies and write rich copy. Combined with an in-depth understanding of your subject matter, you will be able to generate topic ideas on a moment’s notice. Yes, your company blog is a marketing tool, and it needs to be relevant to your business goals. However, not everything needs to be geared towards making money. A blog is only successful when it is able to generate a readership. Find ways to comment on general developments, and tie it back to what you do for a living. Look at topics that do not concern your industry at all, or share an incident from your personal life. For example, the co-founder of my company once wrote about similarities between being married and being a business owner. In his experience, handling a customer and handling a spouse called into practice many similar skills! You may agree or disagree, but it was a fun and relatable topic to explore. It could be a friend or a local community hero, or someone who started before you and can show your readers how to move forward. Try convincing a former customer to answer some questions and turn that into content for your blog. This could be presented in a written or video format. Encourage your subjects to open up by asking them relevant questions. People love reading in-depth interviews, especially those that directly pertain to their work. Interviews are an opportunity to share an inspirational success story and describe in detail how it occurred, exploring the challenges that were surmounted. There is a lot of potential for sound and actionable advice in interviews, as well. Has a recent topic taken your industry by storm? You absolutely must comment on it! Many businesses and consumers are at sea when it comes to deciphering web and technology trends. It would help them to hear from someone who is going through similar confusion or has been able to make sense of the developments in a way that applies to their daily business activities. Don’t shy away from taking on the “experts.” There’s no harm in posing an open question when you are not convinced about the conclusions drawn from latest research. Not only will this give you more ideas to write about, but it will also bring an element of freshness to your work when you dare to take a stand. When you have a mix of formats to work with, creating content is fun. If you want to go down this path, though, you must plan well. It’s tremendously useful to plan at the start of a month what content you should be creating and pushing out each week. This gives you the time you need to chase people for interviews, conduct all the research you want, create videos, or write white papers. It helps to look at how magazine editorial teams plan their monthly issues. They start with an editorial meeting (well in advance) in which everything from the big stories to the centerspreads and photo essays are discussed. They give their writers enough time to go out and get the stories that will make the desired impact. The stories come back to the editorial desk, where they are reviewed and edited to bring them in line with company policy. Should something not materialize, they have a backup ready. They leave nothing to chance, and neither should you. With detailed planning, you will be able to produce content that is relevant, well thought-out, and fresh. What inspires and excites you? 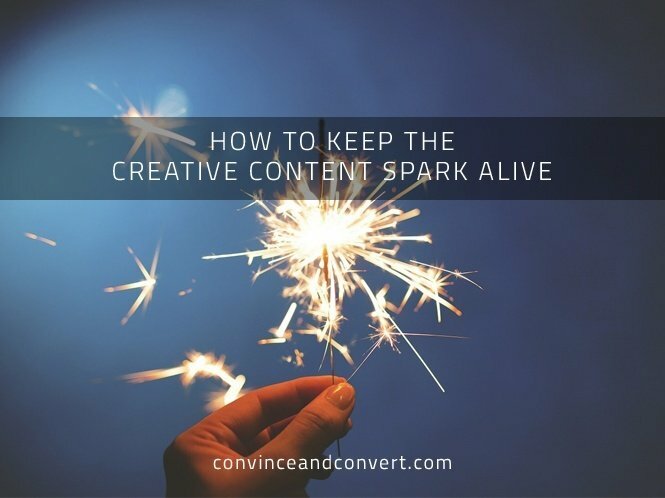 What is the secret behind your spark? How do you stay fresh?